Separate the endstop you want inverting onto a separate line i.e. I was able to get the endstops configured with M574 X2 Y2 S1 Z1 S0, is it more proper to use the 2 lines like you both have commented? For the hotend fan, is there a way to configure the function into the firmware where, anytime the hotend heater is active the fan turns on or do I need to write this into my macros and print start gcode? It would be nice if it was in firmware so I don't forget to turn it on. As far as editing the config files on the SD card, it there an easier way to do this since I don't have an LCD or network access to the board? Right now I'm ejecting the card, editing on my PC and then rebooting the printer. I tried to access the card with Repetier host and Pronterface but couldn't get a response. Thank you for your help so far, I feel like I'm almost ready to print! From Octoprint, I can see the SD card's files in the card's gcodes/ subdirectory. I can also upload files to there. To upload to sys/ you would need to figure out how to get Repetier host or Pronterface to allow you to upload a file with an absolute file path (e.g., beginning with "/sys/"). That way you could upload "/sys/config.g" and then issue a M999 command to restart the processor. Note that dc42 put in the necessary support for absolute file paths around 25 November 2015. So you would need to build the binary yourself: I've not issued a stable release with that support. What is the best/recommended control software (windows) when running RepRap firmware? Panel DUE + 5inch touch LCD (800x480) - have to wait for them to arrive. RepRapFirmware on Duet supports file upload over the web interface and full access to the SD card over FTP. But whoever designed the Arduino Due made the strange decision to use an Ethernet-capable chip but not to provide an Ethernet port, even as an add-on. So Due/RADDS doesn't have Ethernet. You can upload and manage gcode files and some configuration files on the SD card over USB from Pronterface or another USB host program, but that's about it. I do not know if Bluetooth and/or WiFi is supported when using RepRap firmware? If so, can it be used in combination with PanelDUE? 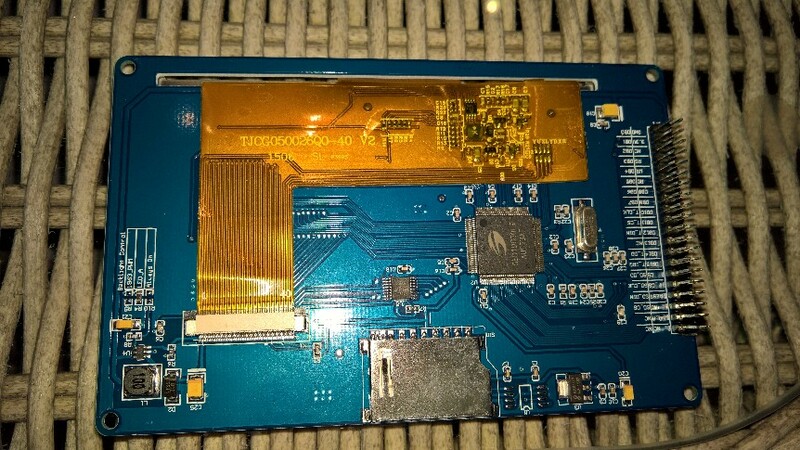 Wifi was originally implemented with RepRapFirmware on RADDS, and later ported to Repetier. See the ESPRINTER thread in the Developers section of these forums. File upload over wifi is supported but is quite slow, 30 kbytes/sec AFAIR. I am told that Due/RADDS has only one usable auxiliary serial port, so you have to choose between WiFi, Bluetooth and PanelDue. Edited 1 time(s). Last edit at 01/08/2016 06:40PM by dc42. I'm having an issue getting my Z probing working. I have it hooked up to the Z min endstop pins. It works great for homing. When running G32 (bed.g) M574 P1-3 says the probe is already triggered and P4 doesn't trigger at all. Is it possible to use the Z End (with digital mode IR trigger) as the probe? Edited 1 time(s). Last edit at 01/08/2016 11:52PM by WestonWW. The RADDS "ADC" pin. (Z_PROBE_PIN in the RepRapFirmware sources.) On the RADDS board, there are three pins labeled as "AUX ADC" and are 3.3V, ADC, and GND. Use the "ADC" pin. These three pins (or pads on the board for a header) are near the 3x4 block of pins (pads) for servo hookups on the RADDS board. This is the pin used to read the analog response from the DIR sensor. The Due digital pin D34 which presents on RADDS as the unused X-max pin. (Z_PROBE_MOD_PIN, Z_PROBE_MOD_PIN07 in the RepRapFirmware.) This is the pin used by the firmware to turn on/off the IR LED. Mind you, I've not tested a differential IR probe with the RADDS board. However, the code is identical between the Duet and RADDS. All that is different are the pin assignments. If it's one of my IR boards, connect it to the three pins of the aux adc connector that Dan describes, and select probe type 1 in M558. That runs it in analog mode, which has the benefit that it reduces the probing speed when getting close to the trigger point. Edited 1 time(s). Last edit at 01/15/2016 06:24AM by dc42. Hi, my 5" LCD arrived today. Connected it to the PanelDUE controller. Then I get the text: Touch the spot, and a black spot - but nothing happens when I touch the spot. I have not connected it to my RADDS yet - should Iget some menus.. without connecting to RADDS? 1. Check that your USB outlet powering the PanelDue + display is capable of supplying enough current. With 5" display the current draw is about 500mA, which is too much for some laptops. If in doubt, use a powered USB hub. 2. Check that your screen has the touch membrane installed. The membrane has a visible outline with 4 connections coming off it the bottom of the screen. These are visible in the picture on that eBay page you linked to.Some suppliers sell the screen without the touch membrane. 3. If you still have the protective film on the front of the display then the touch sensitivity will be reduced. These are resistive membranes, not capacitive ones as used on smartphones, so they react better to a tap with a fingernail than to a push with the pad of a finger. 4. Otherwise, I suspect the display panel is faulty. All PanelDue boards are fully tested before dispatch, and I have no reports of any failing. That looks like a 3.3V panel to me, I think the second pin up on the left hand side in the photo on eBay is even labelled 3.3V. 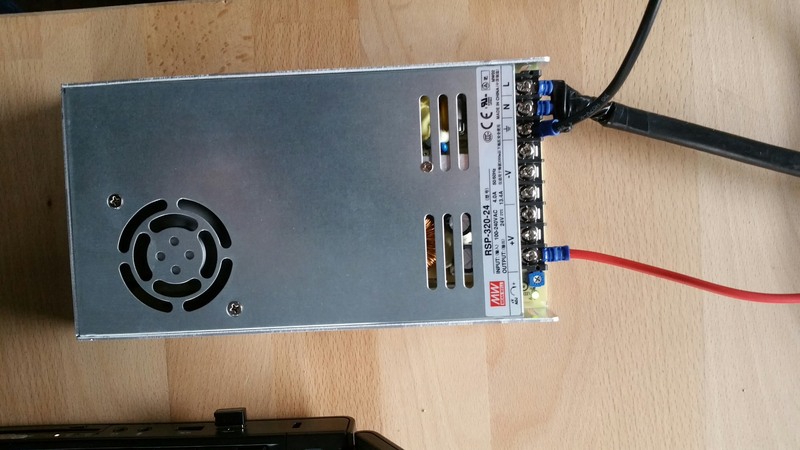 The only panels I have found that take 5V as the main power input are the Itead panels. Edited 1 time(s). Last edit at 01/29/2016 06:32PM by dc42. 2. Check that the soldering on the touch controller IC on the panel looks good. That's the small chip with 8 legs on each side, below the SD card socket. Also check it's the right type - should be XPT2046 or TSC2046. 3. Check that the 4-way Kapton cable from the touch membrane looks securely soldered to the much larger Kapton cable/flexible PCB that connects to the main display PCB. If in doubt, post a high-res photo of the back of the display panel. Edited 1 time(s). Last edit at 01/30/2016 04:20PM by dc42. I have a RADDS 1.5 on Arduino Due and a RADDS LCD 4 x 20. I want to set it up with Repetier firmware but I cannot get it to work. 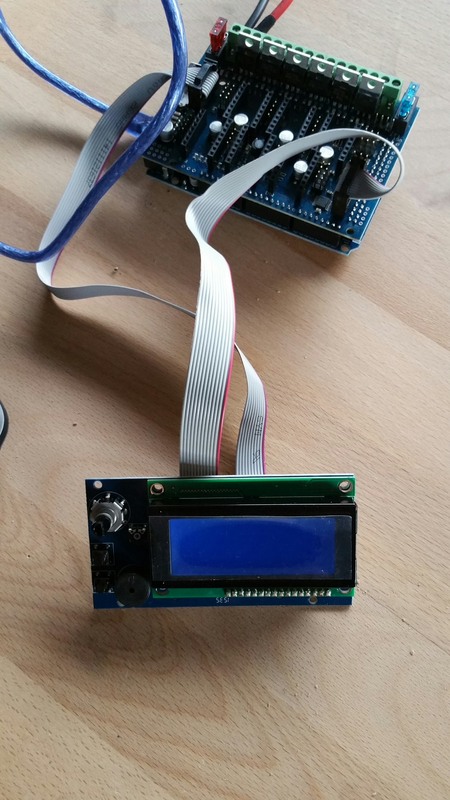 It looks like the RADDS and Arduino are working well but the LCD doesn't. I need the right uiconfig.h and configuration.h settings. Can you help me. It cost me two days already. Can I use repetier firmware 0.92.8? Edited 1 time(s). Last edit at 02/02/2016 02:24PM by mundsen. I did but that didn't lead to anything showing on the screen. It just lights up and flickers a bit and beeps ticking sounds and no characters. - using Arduino to flash the Arduino DUE? No errors when flashing? - The cables connected correct to the LCD panel and the RADDS? 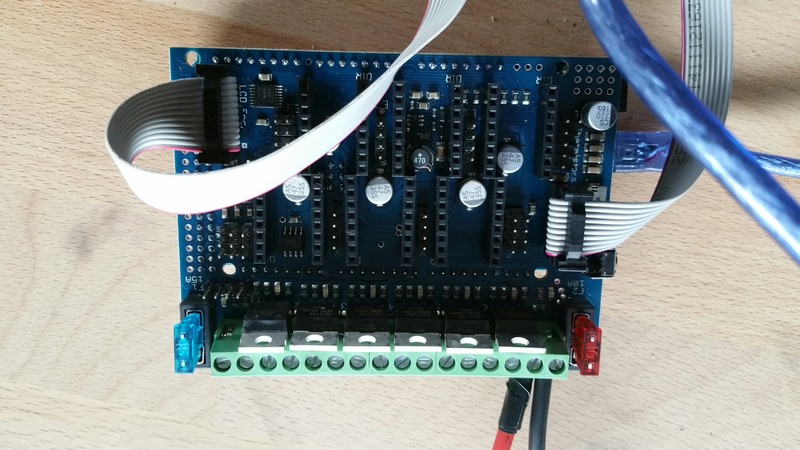 Are you sure you have the plug headers connected the right way on the RADDS and LCD module? "RADDS LCD Display 4x20" is all I needed to set for mine to work in the configuration tool (0.92.8). I would also pull the entire firmware download and not just the Configuration.h file. Edited 1 time(s). Last edit at 02/02/2016 03:53PM by WestonWW. Thx. I have this LCD and wiring is correct as I read from wiring diagrams. See attached photos. Can you test swapping the ends of the cable at right (left = the side with the USB ). You download the complete file set from repetier config + flashing the DUE without any errors? Edited 1 time(s). Last edit at 02/03/2016 07:46AM by mundsen. Yes I will do this. I dowloaded all in .zip and no errors uploading to Arduino. The cable! :-/ that was it. How can I see this in advance? Thanks a lot it is working! From your images it seems like your cable is folded over the contact - that makes it opposite compared to mine. That is why I got the idea? Edited 2 time(s). Last edit at 02/03/2016 12:19PM by mundsen.